Former President George H.W. 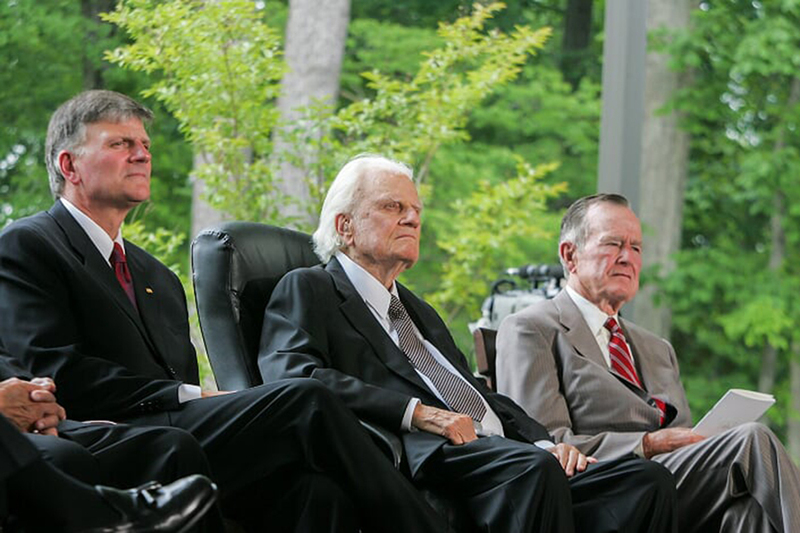 Bush (right) joins Billy Graham and Franklin Graham at the groundbreaking ceremony for the Billy Graham Library in Charlotte, North Carolina. The two families became close friends over the years as Bush was in the White House from 1981-1993, serving as vice president to President Ronald Reagan the first eight years before serving a single term as president. George H.W. Bush, former president of the United States and a good friend of the Graham family, has passed away just seven months after Barbara, his beloved wife of 73 years. President Bush was 94 years old. President Bush passed away at his home in Houston Friday night. He is survived by his five children and their spouses, 17 grandchildren, eight great-grandchildren and two siblings. The elder Bush’s health had been declining in recent months. Former President George W. Bush and former first lady Laura Bush came to Charlotte to meet with Franklin Graham after Billy Graham’s death this past February. 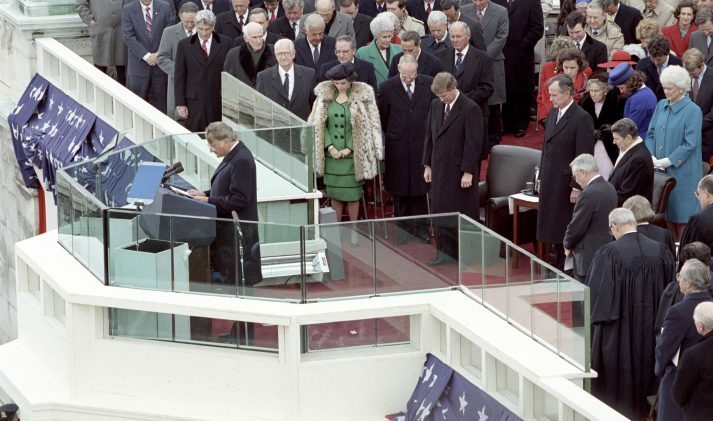 The American public witnessed the Bush-Graham friendship through events such as a Presidential Inauguration, prayer breakfast and even the 2007 Billy Graham Library dedication, where Bush was among several presidents to attend. Earlier this year, the former president described Graham as a “good friend” in a statement after Mr. Graham passed away on Feb. 21. Faith and family were critical for former President George H.W. Bush, who also loved spending time on the water in his speedboat Fidelity. Billy Graham shared in his autobiography Just As I Am that he immediately understood why the life jackets were necessary whenever the 41st president got in the throttle on open water. “If your heart could take the gravity pull, it was exhilarating,” Mr. Graham wrote. Billy Graham, known to many as pastor to the presidents, wrote in his autobiography Just As I Am that he was impressed by how Bush prioritized his family. For instance, Graham noted how immediately after the 1990 State of the Union address, Bush didn’t take a moment to relax. He slipped through the White House just to wish his children goodnight. 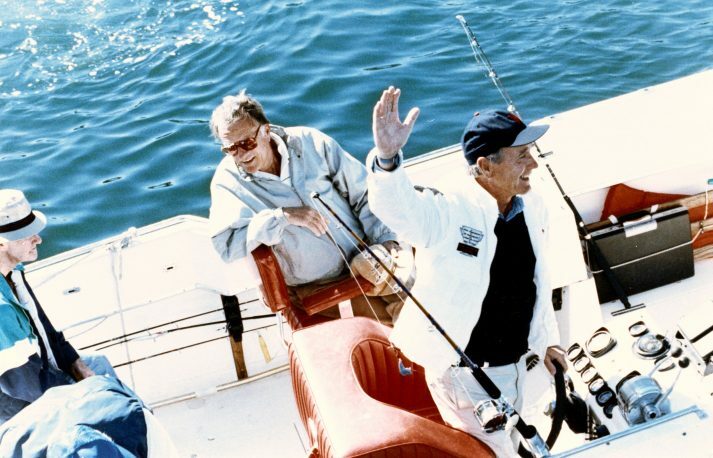 On several occasions, President Bush and his wife Barbara invited Billy and Ruth Graham to vacation with their family at their summer house in Kennebunkport, Maine. The environment was more laid back than the White House and gave the kids a chance to be kids, for the grandchildren to be grandchildren. Faith was never far from the president’s mind, though, and one summer he asked Ruth Graham if her husband would talk with the youth present. She suggested they hold a question-and-answer session. George W. Bush, who served as the 41st president of the United States, credits Billy Graham as leading him to Christ. Mr. Graham was called upon to join Bush and his wife the day the Gulf War began in 1991. Bush didn’t ask for Graham’s political opinion, and Graham didn’t share it. Rather, Mr. Graham offered to pray with the Bushes before Bush Sr. shared the news of the war in a speech to the American people. The next day, at President Bush’s request, Mr. Graham agreed to hold a prayer service for the cabinet, some of the congressional leaders and several hundred Marines at Fort Myer, a military compound across the Potomac River. Former President George H.W. Bush lay in state at the Capitol Rotunda in Washington, D.C., earlier this week. A memorial service for Mr. Bush was held Wednesday at the National Cathedral in Washington, D.C., on the day that President Donald Trump designated as a national day of mourning for the former president. A funeral for Mr. Bush was held at the Bushes church, St. Martin’s Episcopal Church in Houston, Texas, on Thursday, followed by an interment at the George Bush Presidential Library & Museum in College Station, Texas. Please keep the Bush family in your prayers. Do you know Christ personally? Pray now. Billy Graham, Franklin Graham and other family members visiting with Vice President George H.W. 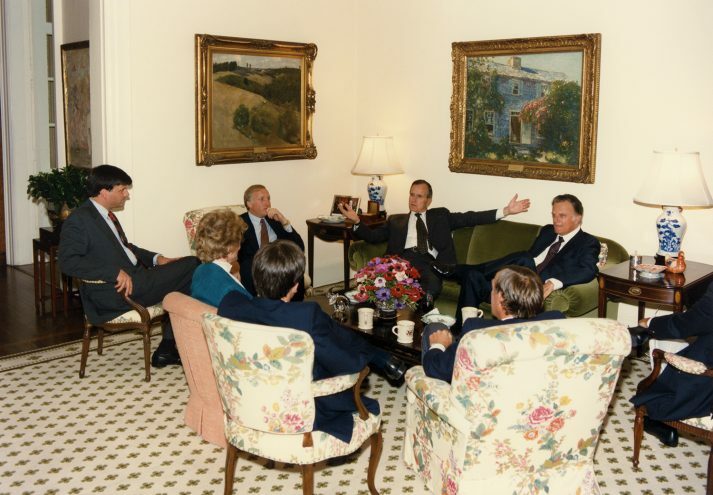 Bush at Bush’s home in 1986. Billy Graham and his wife Ruth met George H.W. Bush and his wife Barbara years before their political prominence through Bush’s father, Sen. Prescott Bush (R-Connecticut, 1952-1963).